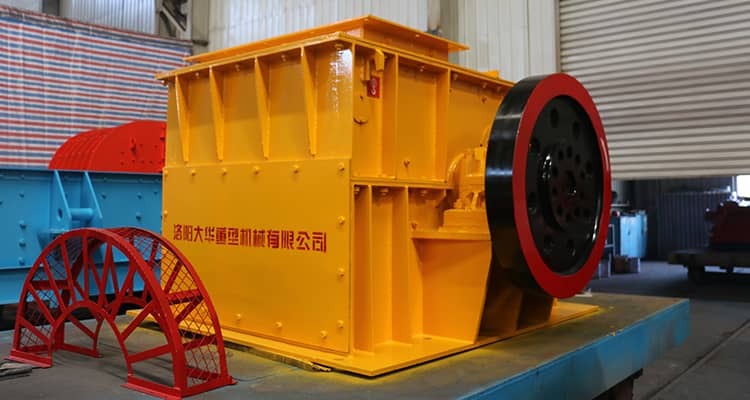 Hammer crusher is applied for the crushing of medium hard materials in the industry of cement, chemical industry, electric power, and metallurgy, such as the medium and fine crushing of limestone, slag, coke, coal and other materials. Therefore, some parts of hammer crusher are easier to be worn, which affects the working condition and service life of hammer crusher. In order to full play the function of hammer crusher, we should focus on the maintenance of hammer head, main shaft and hammer plate. 1. Hammer head is the unnecessary part of hammer crusher, and is the main wearing part. The quality of hammer head directly influences the working efficiency of hammer crusher. During working process, hammer heads should be overturned on time according to the current situation until the hammer head replaced. The new hammer head should be weighed when replacement, and then divided into several groups to make the weight of each group to be equal. Otherwise, it is easy to cause vibration, because the hammer head is error when casting, the weight of each hammer head is not the same. 2. Main shaft bears the huge impacting force generated in the production process, together with the friction, the shaft end will be worn, making bad contact between main shaft and bearing bush result in overheat of bearing bush. It's suggested to add protection cover on main shaft end. Transport the main shaft to machine repair shop, grinding the abrasion parts, and adjust the spacer according to the new diameter of bearing bush. 3. Hammer plate will appear cracking and wear phenomenon in the use process. We should check hammer plate in time, try to repair timely. Because the hammer plates easily clamp the hammer head after bending to cause vibration. For the wear hammer plates, there are two methods to extend the service life of plates: one is wear-resisting layer overlaying on the wear, 2 it is better to coat the wear-resisting layer around the circular surface and one surface nearby side plate before the new side plates replaced.